Back in the late 1970's, when my oldest daughter was a baby, we lived out on a horse farm near Cincinnati. I had a lot of alone time and while she was asleep or quietly playing, I took up needlepointing and embroidering pillows. 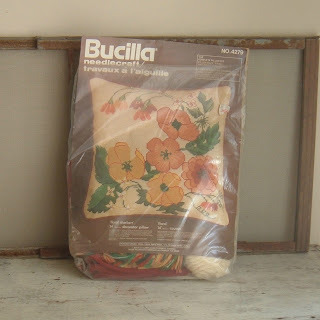 My favorites were always Bucilla. Over the years, all of the pillows were lost or thrown away. I don't know, really what happened to them , but I missed doing the needle work. 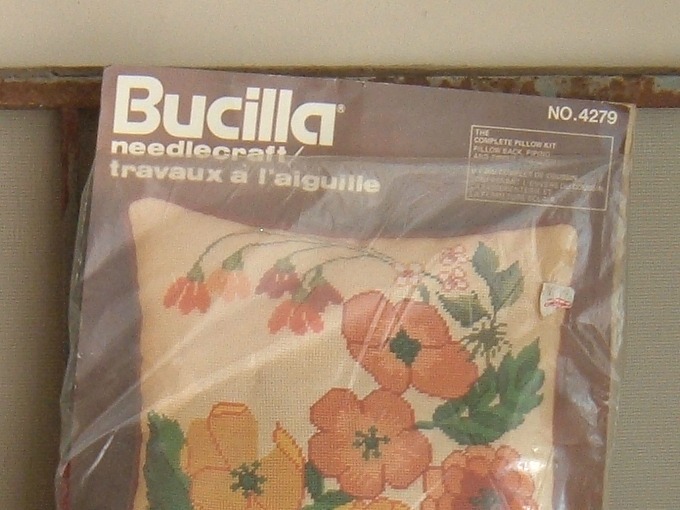 So, knowing that I am going to be having surgery sometime soon and wanting to take needlepoint back up, I have been on the hunt for an old pattern. I was hoping to find one at auction or at a thrift store, because all of the ones I found online, were pretty pricey. Then I got lucky and got this one off of Ebay for $7.50. It was still in its sealed package (I of course immediately tore into it) and ready for me to get working on it. 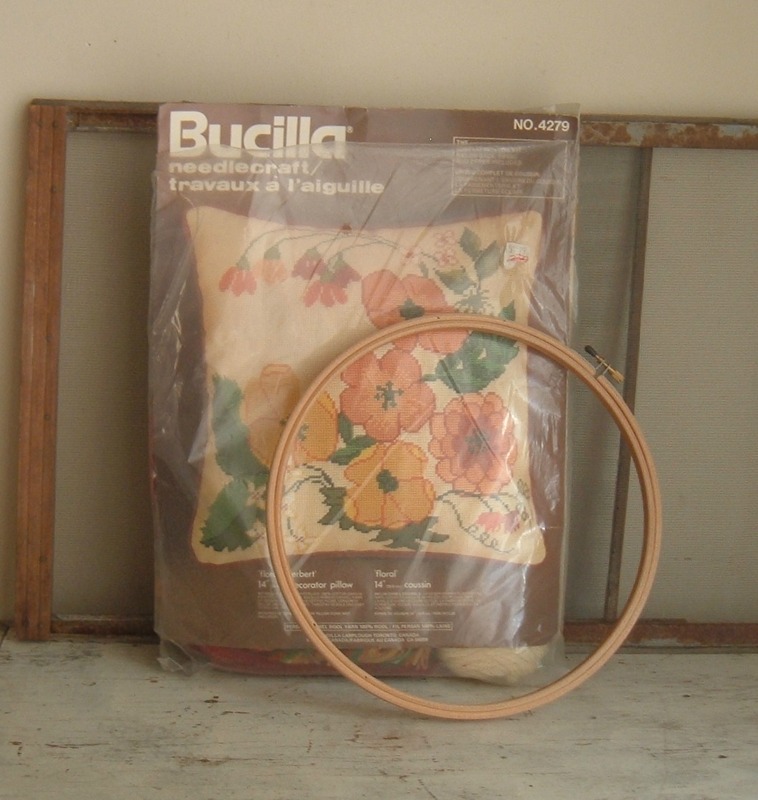 I hunted for the embroidery hoop that was in a box lot I picked up at auction last year. It was nowhere to be found, so I headed off to the fabric store and picked one up. and there it sits. (It's been a month now). Hmmmm, I think it might be time for me to tackle it. I know once I get started, I'll really enjoy doing it. I just have this problem of procrastination. I know, we've talked about this little problem before, but I figured if I announced my project to the world, it would give me the incentive to get started on it. I do hate embarrassing myself. (No I don't, I do it all the time). While you ponder your next project you can rest assured this needlepoint project looks good sitting where you last put it. Besides your not procrastinating your just stock piling for rainy days. Now doesn't that sounds better? 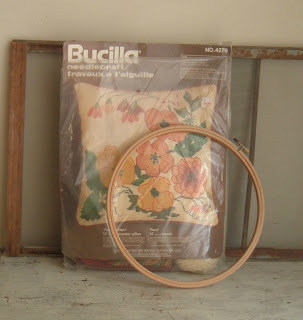 I "tried" needlepoint years ago...I think it's actually in a box somewhere in the attic. I think I got discouraged, being my first project, because my kits pattern wasn't printed correctly on the mesh (or whatever it's called). I do love the look of needlepoint pillows though. Good luck with starting your project, finishing your project and with your surgery! Have a lovely day! Think of it as your dose of meds for a speedier recovery! Can't wait to see the finished pillow and you recouped. I love needlepoint but haven't done it in years. I made all four of us Christmas stockings (took years!) and even one for the dog. Your flowers look like a pretty pattern. I think you're right that it will be a good project for when you are "laid up." That will be a sweet pillow once you finish it... 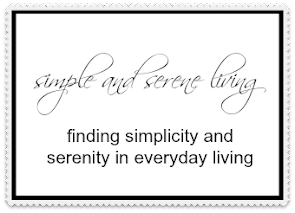 I love cross-stitch and embroidery (never advanced very far with needlepoint). Nice that you found that kit at such a good price! 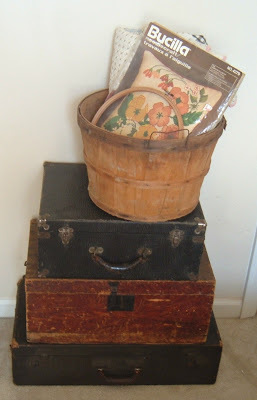 Telling it all on the blog does make you motivated, just look at me, I have almost all of my boxes unpacked. And that's just because I was writing about being burned out from moving. Good luck- you can do it! The flowers are so pretty, nice choice.